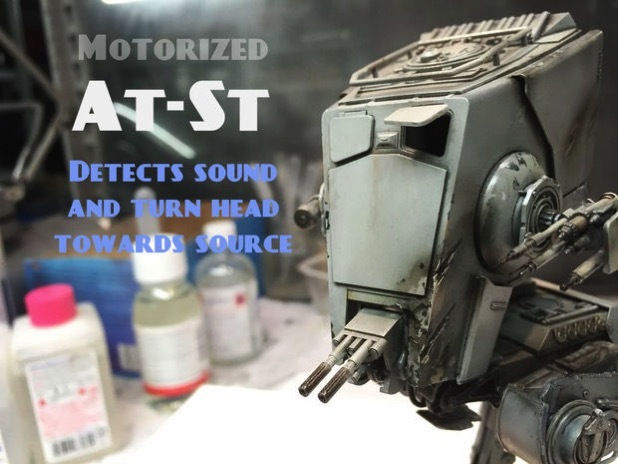 Motorized, Sound reacting Star Wars At-St Bandai Model, with Arduino #SciFiSunday « Adafruit Industries – Makers, hackers, artists, designers and engineers! Epic project tutorial from instructables user Pardopoz. Made from Star Wars At-St Model from Bandai. Reacts to sound and turn its head towards it. Made with Arduino Nano, a 3dprinted custom part, microphones, micro servo. This instructable is made to share the modifications required to achieve the sound reaction anche head rotation capabilities. Includes Arduino Coding, 3d STL Files for printing necessary parts, and obiouvsly instructions to make it happen. Intentionally it won’t focus on painting & weathering process, which is a matter of model making, there also are several resources for this i’ll link later on.